[T]here is a tribe in Africa where the birth date of a child is counted not from when they were born, nor from when they are conceived but from the day that the child was a thought in its mother’s mind. And when a woman decides that she will have a child, she goes off and sits under a tree, by herself, and she listens until she can hear the song of the child that wants to come. And after she’s heard the song of this child, she comes back to the man who will be the child’s father, and teaches it to him. And then, when they make love to physically conceive the child, some of that time they sing the song of the child, as a way to invite it. Kristyn pointed out that some of these stories that get passed around aren’t authentic, even though this one in particular was very nice. I decided to look into it a little more and here’s what I found. The link is pretty much word for word of the last link, and credits the source as being from Welcoming Spirit Home: Ancient African Teachings to Celebrate Children and Community New World Library, from Sobonfu Some. Elizabeth commented on the interesting red-brown skin color of the woman in the picture (the first one pictured in this post). It’s actually not natural, but comes from a paste applied. This is done by the Himba of Namibia. 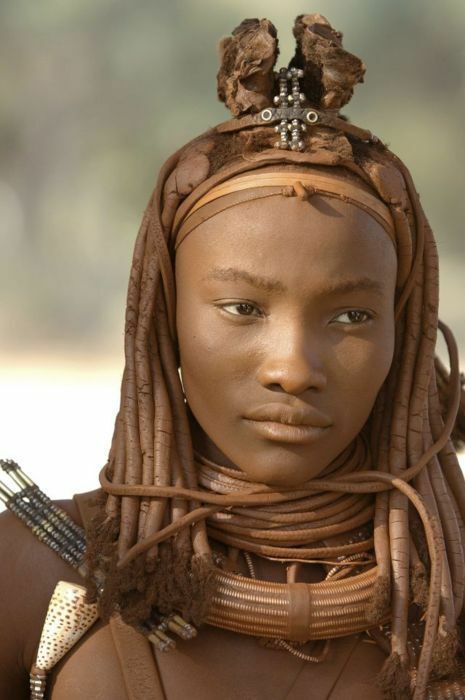 The characteristic ‘look’ of the Himba comes from intricate hairstyles, traditional clothing, the use of personal adornments in the form of jewellery, as well as the use of a mixture of red ochre, butter and resin from the Omuzumba shrub. This paste is known as ‘otjize’ used as protection against the weather and a skin lotion. It is rubbed on the skin, into hair and onto traditional clothing. When a woman is ready to give birth, she will be accompanied by a group of women outside the homestead. They will assist her during her labour. Immediately after the child is born, the women return to the homestead. The mother and child then spend a week at a special shelter built to the side of the headman’s hut, near the sacred fire, under special protection of the ancestral spirits. After the week has passed, the child is brought to the sacred fire and introduced to the spirits of the ancestors by the headman. The child is given names from the patrilineal and matrilineal lines, ensuring that the origins of the child are known. Were the people of Namibia the same people with the “birth song”? The retellings of the story are so ambiguous with their whole “somewhere in Africa” lore. When a woman of the Himba African tribe knows she is pregnant, she goes to the jungle with other women, and together they pray and meditate until they find The Song of the Child. When a child is born, the community gets together and they sing the child’s song. When the child begins it’s education, people get together and the child sings their own song. When they become an adult, the community gets together again to sing it. When it comes to your wedding, you hear your song. Finally, when their soul is going from this world, family and friends are approaching and, like at their birth, sing their song to accompany it in the journey. I’m still not sure about the Birth Song story, but it’s going around a lot, and is often credited to the Himba (when it even specifies). It might be accurate. Buy Elizabeth McKeown’s radical book about her birth journeys, In Search of the Perfect Birth, on Kindle or with Amazon in paperback.